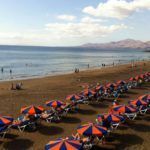 The long Guacimeta Beach is situated on the outskirts of the airports grounds allowing us to observe flying aircrafts from just 100 metres above whilst sunbathing, swimming or reading a daily newspaper. 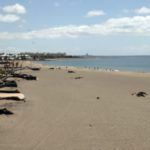 This amazing airshow, especially on Thursday and Sundays (main change over days) adds an extra bonus to the excellent sunbathing and beach conditions of Guacimeta. The sand on this bay is splendid. It is fine and melts away when the sea rises in its calm waters, just like a postcard. 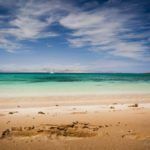 On this stretch of coastline there is almost always a strong breeze (its main downfall) and therefore it is advisable to take shelter behind the small natural stoned coves as you get closer to the airport. 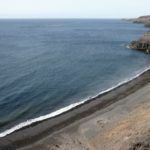 Guacimeta Beach is connected northerly by the beach town of Playa Honda and to the south by that of Matagorda’s in Puerto Del Carmen. Its wide space joined by its ample width allows children to play beach games. 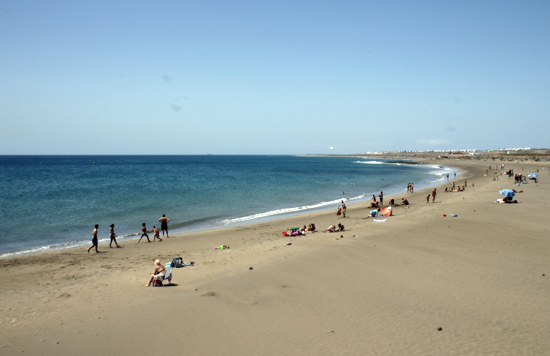 Guacimeta Beach is reached via the busy road of Playa Honda. 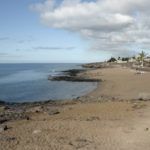 A dormitory town approximately five kilometres from Arrecife which has a kilometre long street of restaurants and nice terraces. 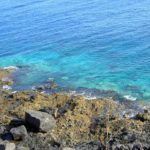 Guacimeta is an ideal location for taking part in a day of sport for example a bike ride between Puerto del Carmen, Playa Honda or Arrecife (pathway only), sunbathing, or food or beer on the terraces while the sunsets. One kilometre of golden beach. If you arrive by car you will find a big parking space just infront of the beach. 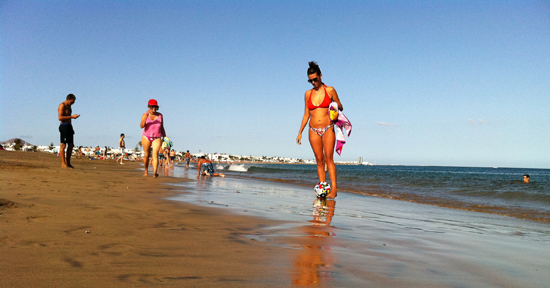 From Puerto del Carmen and Arrecife you can also walk or rent a bike and make the whole way along the sea. Services: Public bathrooms, showers. Many restaurants along the promenade.